Welcome to the Street Art Fest! Things are shaping up for this year's event and everyone is invited to join us for a fun day celebrating Art on Highland's Downtown Square! If you are an artist, this is a fun opportunity to show your stuff, so take a look around our website. ​Wondering what this neat event is all about? 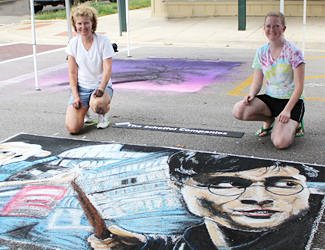 Yes, the streets of Highland do become a canvas for talented artists during this one-of-a-kind festival! Carrying on a tradition started centuries ago, on Saturday, September 15th, the 16th Annual Street Art Festival and Art Expo will turn the streets of downtown Highland into a temporary art gallery. Curious about Street Art? See more PHOTOS! The great tradition of street painting began in Italy in the 16th century. 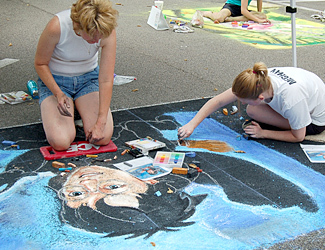 A crowd would gather whenever a traveling artist began transforming the pavement into a colorful work of art. Although the masterpiece only lasted until the next rain, the tradition of street painting has endured, and we invite you to be part of this timeless experience! 30 Artists Creating Art on the Streets: Meander down the street and watch as 30 or more talented artists create artwork of amazing color, depth and complexity - with chalk! Children's Avenue: Children ages 5-15 can register the day of the event for a 2'x2' square on the Children's Avenue to complete their own work of art which will be judged by the Street Art Judges. Winners will receive a ribbon. Lots of Food Choices: Sample some tasty barbeque, pizza, or brats and have a beverage or some ice-cream, too. Beer Tasting Festival: Take advantage of this opportunity to sample over 20 different beers! Bags Tournament: How's your throwing arm? Sign yourself and a partner up for this fun tournament here. Makers Market & Art Expo: Don’t forget to check out the new Makers Market & Art Expo - upcycled home decor, paintings, jewelry, pottery, photography and more, all made by local artists, will be available for sale. If you are a local artisan that would like to participate in the Makers Market fill out an application here. Kreative Kids Korner for the Kids: Kids have their own special "Kreative Kids Korner" at this family-friendly event where they have the chance to make their own works of art and enjoy some imaginative fun and games. A Relaxing, Hometown Environment: Art, music, great food and beverages, all at Highland’s beautiful downtown square, combine to make this an event you won’t want to miss!